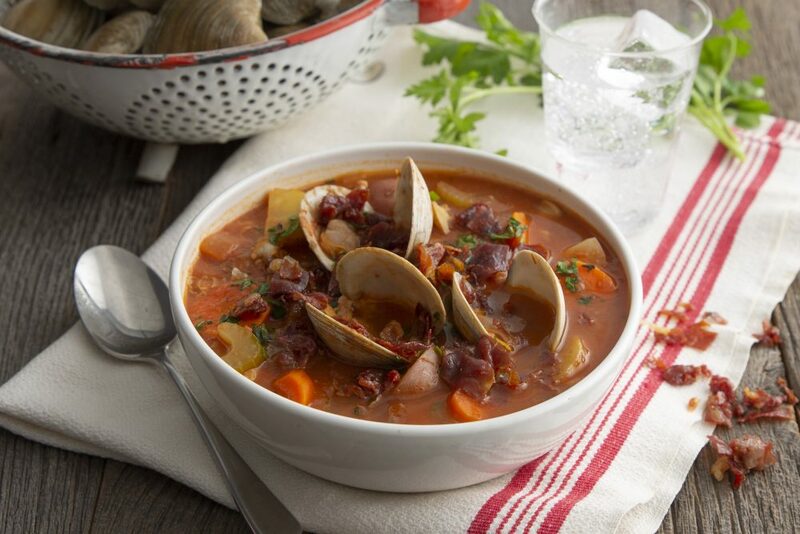 This Manhattan clam chowder, topped with crispy prosciutto is set to be your new favorite cool weather dish. Spicy, flavorful, and packed with crispy prosciutto inside the soup and on top, there isn’t a thing not to love about this chowder. Plus, it’s easy to make. So, say hello to your new favorite weeknight or weekend dish. In a large saucepot over medium-high heat, cook prosciutto until crispy; reserve. In same pot heat oil and cook potatoes, carrots, celery, onion, bay leaves, garlic, thyme and kosher salt until vegetables are tender-crisp, about 7 minutes. Reserve ¼ cup crispy prosciutto and stir remaining crispy prosciutto into vegetable mixture. Add clam juice, crushed tomatoes and canned clams with their juices and bring to a boil. Reduce heat to medium and simmer until vegetables are tender, about 20 minutes. Add littleneck clams and cook, covered, until clams open, about 5 minutes. Stir in hot sauce to taste. Top with reserved crispy prosciutto and chopped parsley.